OUR PRICE: $58.65 - Join Rewards Get $5 Dance Dollars On This Item! Very comfortable and durable. Nice looking too. I purchased this for my granddaughter and I went up a whole size and it was way too small. Like three sizes too small. The shipping back was $10.00. Because of the issues with sizes of this shoe I repurchased at a company that pays for the return shipping. At first I was hesitant but after other reviews i decided to buy them and no regrets. I'm 45 year old male and love to dance and researched on what I can get so I decided to come over to Discount Dance and it was a good experience. Fast delivery. I'm a size 9 and ordered size 11 and fits great. I bought these for my daughter who is on her high school dance team. They are true to size and fit her perfectly. I definitely will be purchasing from you again. Love the style & fit (runs small but I ordered 2 sizes bigger so they fit perfectly). The pair came with 2 sets of shoelaces (black & red) so you can change them for a different look. Danced with them already & they were comfortable. My only hope is that they won't get soft quickly (like my other Capezios of a different style) as it's not good support. 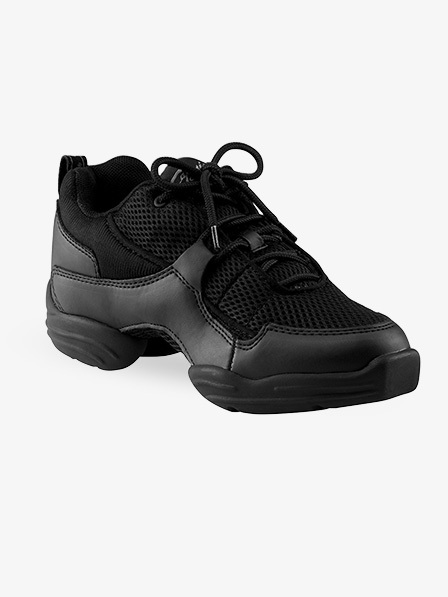 I bought a pair of these dance sneakers a few years ago when I needed them for an audition. I'm waiting on another pair to come now because they're finally falling apart on me. In the past few years, I've used these shoes for everything from running to Zumba to dancing to just going to work. They're super comfortable, and the lack of hard plastic sole in the arch means you can bend and point your foot easily. The plastic on the toe allows you to hop onto pointe for short periods of time, making these shoes great for jazz or hip-hop pieces where you want to show off. I have used this shoe for the past 6 years. This shoe is extremely comfortable, flexible and gives great support. I use them to teach dance (I teach 5-8 hrs a day 5 days a week ). I walk in them all day as I go from building to building on campus to teach. I also use them when I take class. All of my jazz students have them and they love them as well. Make sure you order them 1 size larger than your shoe size. This runs really small. Add 2 sizes at least for a child. I bought these shoes because they were recommended for dance team. I wore them for two years and they began showing signs of wear after one. They started to peel and the front part of the shoe started to come off after a while. They also gave me shin splints and didn't seem to perform as well as other shoes. They also were a lot less attractive than other jazz sneakers. Now I have Blochs and prefer them over these Capezios. I bought these shoes over 14 months ago. They are still in good shape. They have so far been through 10 months of rehearsals and 6 stage performances, without any foot problems or the shoes coming apart. I bought these for my son and he seems to like them well enough as far as comfort and flexibility go. But after only wearing them a couple of times, the entire front sole came off - it's glued on, not sewn. We've tried to re-glue with high quality rubber glue but it came off again. Buyer beware. The arch is not high enough and they aren't very supportive on my feet. I have blisters! They aren't flexible and are hard to point your foot in. I've had them for over a year and they still haven't loosened up. I do color guard and dance, and they just get in the way. My favorite dance sneakers. I wear them to all my hip-hop classes. I've had them for a year and a half, but after my first class, the top of the toes started chipping. I colored over it with black permanent marker and it's fine now! I highly recommend these! They are very comfortable. I just got these in today, and I LOVE them. Highly recommended. Love these sneakers! I wear them especially for swing dancing but have worn them for hip hop classes as well. 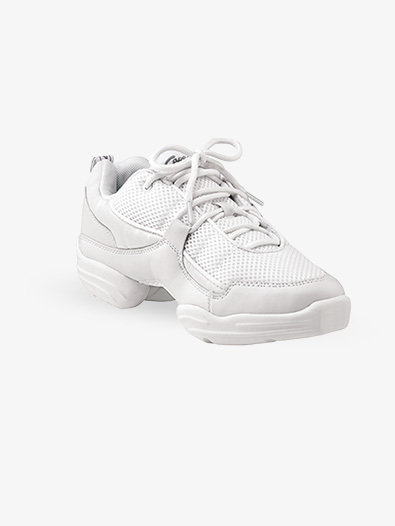 Great comfort of a sneaker but with the flexibility needed for a dancer. I love these. They are awesome!!! They are really comfy and they fit great!! I love the red in them and the red laces are cool! You can even wear them out to school!!! I got a pair of these for Christmas, and I love them! They give great support and are really fun! It's nice to be able to dance down the street. Is the label red on the white pair of shoes as well? The label and accents on the white shoes is white with grey lettering. The black shoe is completely black with grey lettering on the label and accents. The shoe shown with the red accents and black lettering is the red option for the shoe.